Organization tools for hospitals and medical offices. 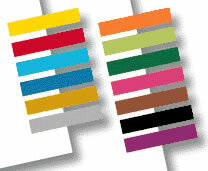 Color-code, mark and draw attention with small flags in 13 solid colors. Self-stick flags and tabs will stick securely to chart documents without falling off, tearing or leaving a residue. Contact Franklin Mills for a mix and match quantity discount. Click here to view our complete Redi-tag catalog.